I got a head of cauliflower at the store yesterday because it looked good, but I couldn’t figure out what to do with it. I thought about roasting it, and I may roast the other half, but that was going to take to long for the level of my hunger. 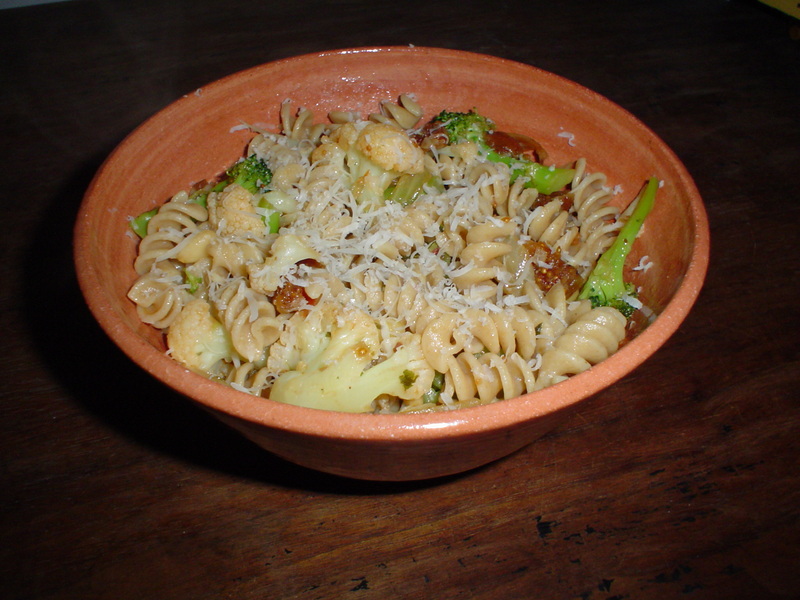 I found a recipe in Mark Bitman for Pasta and Cauliflower, and this recipe is loosely adapted from that. This would be even better with a teaspoon of Dijon mustard thrown in with the tomato paste. Put a pot of water on to boil. Chop the cauliflower and/or broccoli into piece about an inch big. Slice the onion in thin strips, from root to top. Then cut those slices in half crosswise. Slip the cauliflower/broccoli into the pot of boiling water. Start with any stem pieces and let those boil for a minute before adding the other pieces. Boil until just barely tender, 3-4 minutes. The pieces will continue to cook more in the sauce, and you don’t want them to get mushy. Remove the veggies with a slotted spoon or fork, and set them aside for now. Keep the pot of water on for the pasta. You might need to add some extra water. Remove about 1/4 cup of water and set aside. Heat a large skillet over medium-low heat (you can do this while the veggies are cooking). Add the olive oil and onions. Saute until translucent, about ten minutes. Meanwhile, mince the garlic, and chop the figs into 1/2 inch pieces. Begin cooking the pasta in the water. When the onion is done, add the garlic and pepper flakes. Saute about two minutes. Add the reserved veggies and water, tomato paste, and the herbs. Saute 4-5 minutes until veggies are tender. Add the figs and pine nuts. Saute until figs are very soft. Turn the heat off the pan. Drain the pasta when it’s done and toss with the veggie mix. Top each serving with grated Parmesean (this is the only real salt in the dish, so if you are making this without the cheese, you should compensate for that with something).